Plexidor Pet Doors: What is an assistance dog? There are many types of working dogs, and assistance dogs is a category that truly enhances people's lives through providing specific services. Service dogs, helping people with other types of disabilities. Guide dogs assist humans through helping them avoid obstacles, stopping at steps and curbs, and negotiating traffic. The human provides directional commands, but the dog has to ensure the team's safety. This can be difficult and requires a lot from the dog, because keeping a person safe can require disobeying a direct command. Hearing dogs assist through alerting their handlers to a variety of sounds, such as doorbells, alarm clocks, telephones, crying babies, and many other important sounds. The dogs are trained to make physical contact with their human partner, and lead them to the source of the sound. Service dogs help humans with a wide variety of tasks. Some are trained to work with wheelchairs, some help children with autism, others are medical alert dogs. Depending on their task, they're often trained to retrieve objects, opening and closing doors, turning lights on and off, finding help, providing balance, and a variety of other things. Assistance dogs are recognized by the Americans with Disabilities Act and must be allowed access to any place that is open to the public. 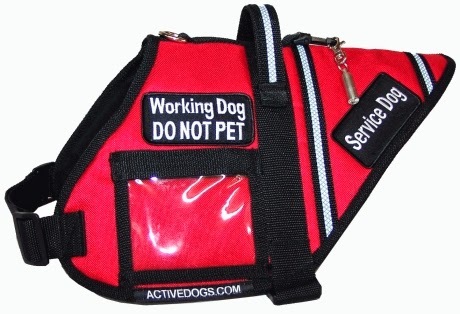 They often wear special harnesses or vests identifying them, but not always. As assistance dog can also be a therapy dog, but it's not necessarily the same thing. Assistance dogs are trained to perform specific tasks, while therapy dogs are trained to provide affection and comfort to people in hospitals, retirement homes, nursing homes, disaster areas, and many other situations. Therapeutic visitation dogs, who visit hospitals, nursing homes, and similar places where the visiting dog can brighten the day, comfort, and motivate people. Animal assisted therapy dogs, who assist physical and occupational therapists. These dogs often work in rehabilitation facilities, and help humans gain motion in limbs, regain fine motor control, and similar tasks. Therapy dogs undergo training, and in many areas they must pass the Canine Good Citizen test as well as a therapy dog certification test. Therapy dogs and their handlers are not covered by the Americans with Disabilities Act. Another important difference is that while the general public should not approach a working service dog and distract them from their job, they are encouraged to pet therapy dogs. It's the dog's job. There are also emotional support dogs. They provide comfort and emotional support to their person, but are not technically considered service dogs under the Americans with Disabilities Act. They do, however, have rights under the Fair Housing Act and Air Carrier Access Act. Regardless of task and breed, they all perform important jobs that make a world of difference for people.